You can register your Restoration here and Activate the Warranty. To do so, please login, or if this is your first visit to ACDLACeritifed.com, please register. This email address will be used to resend your login information if you forget it, and doesn't need to be the same email address listed in your AmericaSmiles.com account. This profile has already been claimed. The login credentials have been resent to the email address in our records. Please check your email to login. 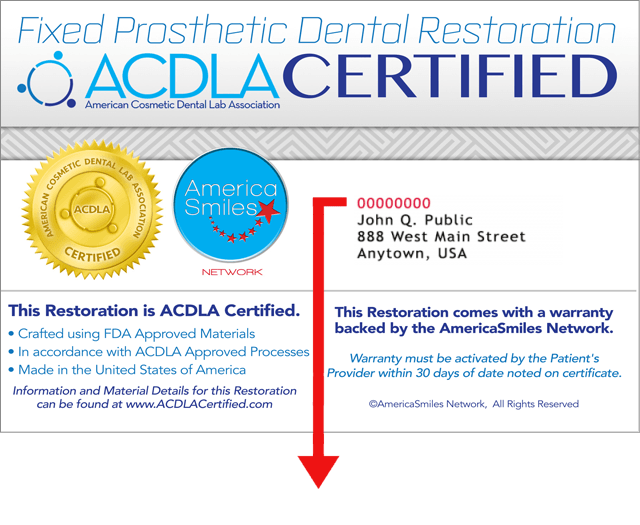 Do you have questions about the ACDLA Certified Program? Contact us and we'll be glad to help you out.